Its time to rejoice and celebrate all the hard work we have put together for the last two years at our two community farms. 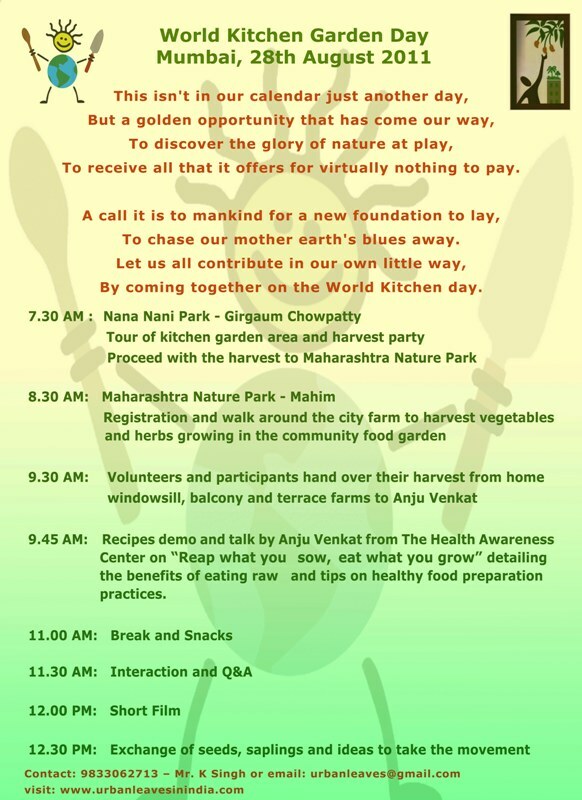 We invite you to join us in this celebration, of " Reap what you sow, eat what you grow" World Kitchen Garden Day festival with Urban Leaves. Our two community farms, and numerous green balcony spaces are a testimony to the fact that cities (even like MUMBAI ) and farms can co-exist! That little spaces of your window sill and balconies too can be productive.That even you can take charge of your food. That you dont get fooled by the scary talks of those in power about food security. That nature gives abundant fruit when you work in harmony! That you and your children can yet connect to nature and learn to live in sustainable cities. 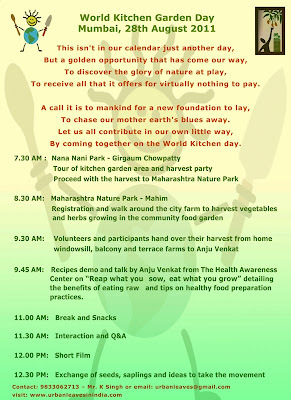 For those who live in other parts of India and wish to participate with the rest of the world....check out the list below to see activities in your city. Contact kitchen gardeners in your city, join them OR contact us and host an event yourself. Mail us mailto:urbanleaves@gmail.comfor guidance or help.